1. Whip egg whites very stiffly. 2. Gradually beat in half the sugar, then fold in the remainder. 3. Place an 8-inch round of wax paper on one of the baking sheets, cover with meringue, build up sides slightly. 4. Pipe two handles onto wax paper placed on second baking sheet. 5. Dry out for time and temperature given, store in airtight tin until ready to fill. 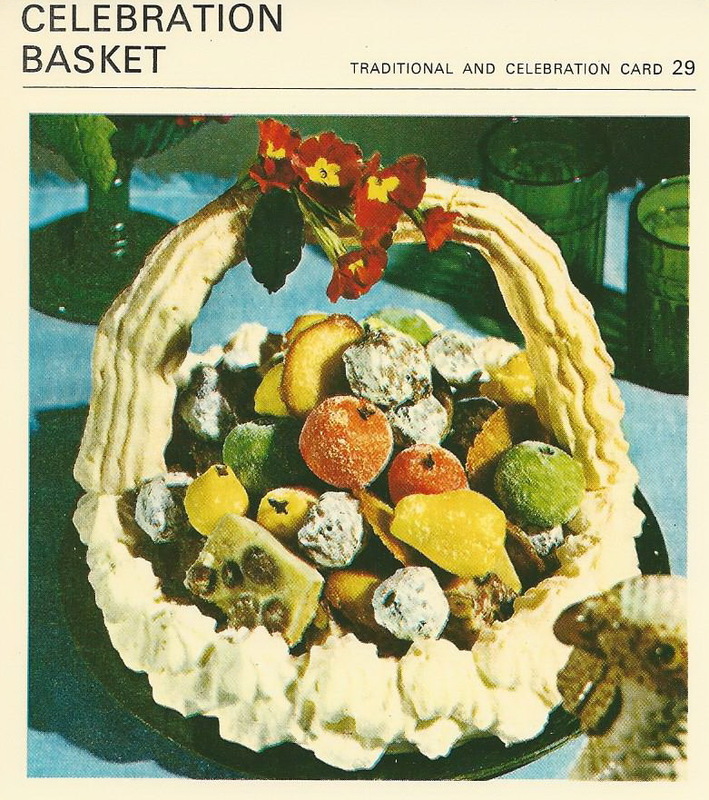 TO SERVE: Stick the handles together and to the sides of the basket with a little cream. Fill basket with almond paste fruits, hazelnut fudge,brandy pennies and chocolate truffles. Almond paste fruits: Form almond paste into desired shapes, tint with food colorings – apples green with a clove for based; orange food coloring for oranges; pears a saffron yellow with a clove for base. Sprinkle with sugar. Printed in Canada. ©Copyright Paul Hamlyn Ltd. 1967.